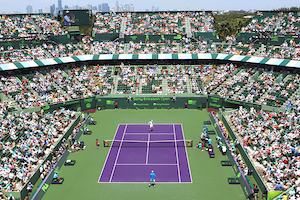 Tag Archive | "International Tennis Championships"
At the International Tennis Championship, being seeded number one has always been a malediction. 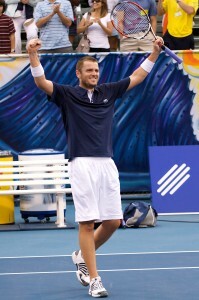 But today, American Mardy Fish dispelled that curse by becoming the first top seed to win in Delray. 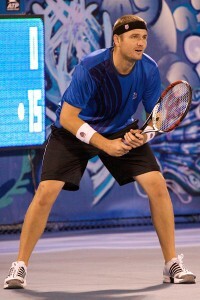 Fish prevailed over 21 year-old Russian qualifier Evgeny Korolev 7-5, 6-3 for his third career title. In this match, the weather was a significant part of the story. While the swirling wind contributed to Fish’s tentative play, Korolev did not modify his game plan and went for his shots. After Fish held serve, Korolev had a love service game to start his first ATP final. Then, the Russian put away a forehand crosscourt winner for deuce. Mardy countered with a forehand winner for game point. But, Fish could not control his next forehand. Play was interrupted at deuce by rain. When the players returned, Korolev reached break point and converted for a 2-1 lead. The Russian’s advantage faded when with crosscourt unforced errors on the backhand and forehand side, Korolev allowed Fish to break back. However, in the subsequent game, on his third break try, Korolev crushed a backhand return which resulted in an error from Fish giving the Russian the lead again for 3-2. After Korolev consolidated with a love game, he hit a forehand down the line winner for break point, now a double break advantage was at stake. 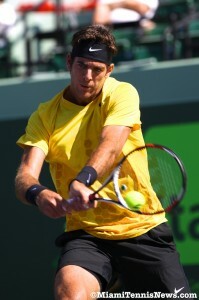 But, Fish pulled out the game with a few good serves. After his third love game for 5-3, in a 15-40 game, Korolev made a sensational backhand dropshot to get to deuce. Again, with a couple of unforced errors by Korolev, Fish was let off the hook. After connecting on a forehand down the line winner to begin serving out the set, Korolev made three consecutive unforced errors to face double break point. With a bold backhand dropshot winner and a backhand down the line error from Fish, Korolev got to deuce. However, when Korolev failed with another dropshot, Fish had an advantage point. Then, Evgeny netted a forehand volley to equalize the set at 5-5. After escaping with a hold with a forehand volley winner, aided by his rival, Fish arrived at triple break point. When Korolev misfired on the forehand, Fish pocketed the first set. After a disappointing lost in the 2008 doubles final at the International Tennis Championships, world number one and top seed, Mike and Bob Bryan, bounced back this year by defeating the second seed, Brazilians Marcelo Melo and Andre Sa in straight sets 6-4, 6-4. 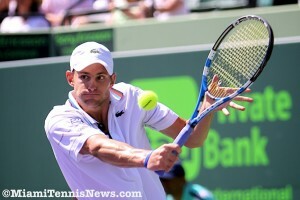 The Brazilians began well which troubled the Bryans as they produced a flurry of unforced errors. In the third game, Melo and Sa had triple break point. However, with clutch serving and by holding his composure after an ace was taken off the board due to a foot fault, Mike Bryan came out unscathed to equalize things at 2-2. The set’s next crucial moment came with Sa serving. After the Brazilians lead 40-15, the Bryans broke for a 4-3 advantage. With Mike serving, a crosscourt return by Sa hit Melo in the vicinity of the right eye, a frightening episode causing a temporary halt in the action. Fortunately, Marcelo recovered. After Mike Bryan consolidated the break, Melo closed out his service game with an ace for 4-5. Regardless, with a backhand volley winner by Mike and with two good serves by Bob, the Bryans captured the first set. In the second set, the Bryans had the opportunity for the early lead. With a forehand return winner, they arrived at a deciding point. But, Melo salvaged the game with a great serve. Bob Bryan continued his strong serving, sealing his game with an ace for 1 all. Each team had a fairly unadventurous time holding serve until the seventh game. After leading 40-15, Melo missed an easy forehand volley, then, Sa volleyed up for 40-40 which meant in essence a break point. Fortunately, Melo’s forehand volley just caught the line which saved the game for 4-3. Thereafter, the Bryans had no trouble on their own service game and pressured the Brazilians. With Melo serving, Mike placed a sensational lob resulting in an unforced error by Melo. Then, Sa mishit a forehand volley to hand the Bryans triple break point. 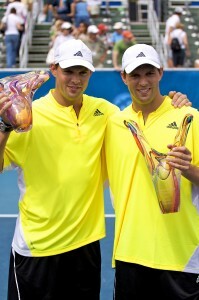 With a forehand winner, the Bryans went up 5-4. With sure handed Bob serving, the Bryans put away a backhand volley up the line, forced three service return errors to secure the match.